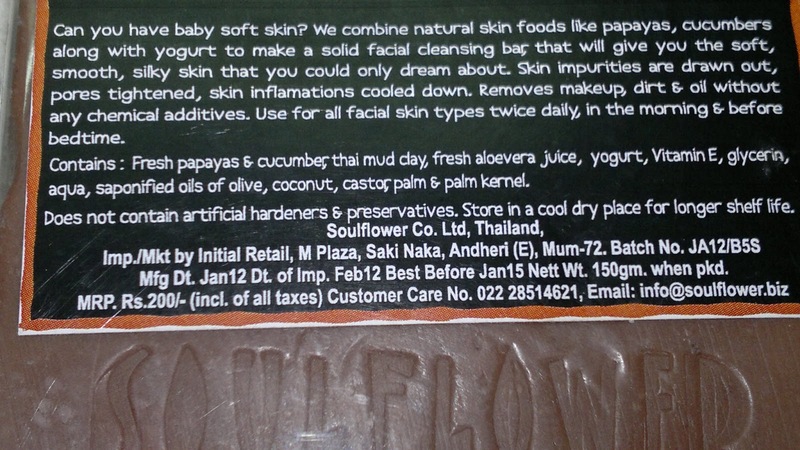 So today, I am reviewing a good soap from SoulFlower, which has become my favorite brands ‘cause they make some really awesome soaps. This is my fourth I think J. This one is for facial skin specifically but as it is winters and it has all the lovely ingredients, I use it for bathing as well. Price: INR 200 for 150 gm of soap. I got this at a discounted price of INR 164 online. The packaging is basic and eco-friendly which I like a lot. The soap is brown choclaty in color mainly ‘cause it has cocoa as an ingredient. 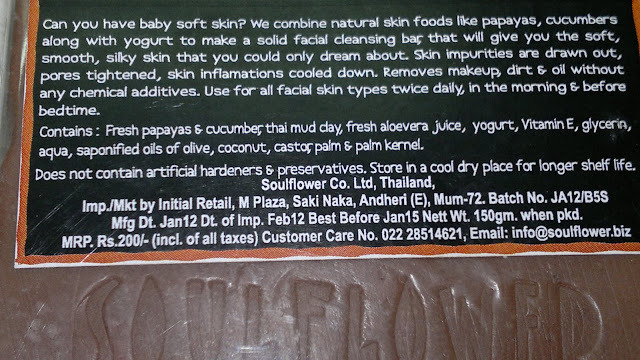 I like the chocolaty biscuit smell of the soap and also the way it cleanses and moisturizes my skin at the same time. Even in this weather I don’t feel the need to moisturize my skin immediately after hot shower. It leaves a nice film of moisturizer on my skin and makes it soft. The facial soap is claimed to remove makeup as well and I found this claim to be true to some extent though not completely. It removes the makeup gently enough but for waterproof and stubborn makeup, I need to use this twice for complete makeup removal. So, I use this in place of a face wash these days, i.e. after removing the makeup using my makeup remover. It cleans my face well and it feels clean though not dry or stretchy and baby soft. So in that ways, I guess the soap lives up to its name. 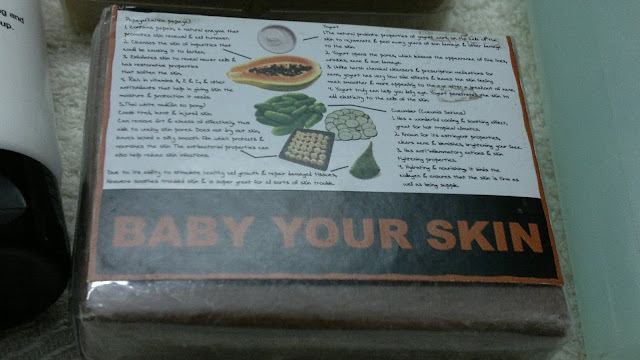 Though I refrain from using soaps on my skin, this is one soap, which I can use without much thinking. Product rating: A-, available on online shops and soulflower stores. I would recommend this to all looking for a good facial cleanser and personally would buy it always.